The following is a press release from Nike.com. It discusses the evolution from cotton T-shirts, polypropylene and Lycra, Dri-FIT and today’s Nike Pro. It’s a long but interesting read. There is a code among Nike Athletes: Devotion is the heart of success, and preparation is the soul of performance. In order to reach levels higher than most athletes have to train harder than the rest. They have to understand the beautiful side of obsession, the side that accepts no boundaries and knows no limits. At Nike a rich heritage of training has led to a series of innovations designed to explore this obsession and to feed an athletes’ hunger for their highest level of performance. Since the days when cotton tees were considered the pinnacle of base layer protection to the current wave of groundbreaking NIKE PRO technologies, there has been one consistent, obsessive goal: Give the athletes everything they need, from training to game day. And because athletes strive to become bigger, faster, and stronger, Nike has spent decades researching and producing competitive gear that helps them train hard and compete even harder. For Nike researchers and designers the athletes’ insights have become inspiration and their needs have become direction. Over the last decade the concept of base layer apparel has journeyed from imagination to incredible innovation, traveling a path navigated by an intense understanding of what it means for an athlete to train, improve and perform. Nike Knows Training. Nike knows the edge an athlete gains from remaining cool, comfortable, and dry in the heat of battle. Nike knows the advantage of staying warm when the cold threatens to limit an athlete’s production and staying protected when injury threatens to interrupt performance. Nike knows that the first layer of victory is the layer closest to the athlete’s body — the base layer, the gear born from decades of pure innovation and a lifetime of beautiful obsession. Players always wore them. Simple cotton tees underneath uniforms and jerseys used to be just an added layer of clothing to soak up the sweat the body produces when involved in vigorous exercise. But in the mid 1980s, Nike took a very close look at the physiology behind sporting activities and began developing apparel to not only protect the athlete who wore it but also enhance the athlete’s performance. Runners, cyclists, and tri-athletes were the first to gravitate toward Nike’s new direction in apparel engineering. The size and specs of classic cotton-based tees were designed for a more athletic fit. Soon cotton gave way to experiments in Lycra as Nike designers searched for one fabric that could work for everything. This notion of gear that could move with the athlete in turn inspired a collection of tops, shorts, and tights aimed at elevating the meaning of sport apparel and the engineering behind it. From a very early stage Nike demonstrated its desire to innovate, along with an intense willingness to allow that innovation to be guided and assessed by the athletes themselves. The technological leaps and bounds that began in the roots of cotton and Lycra owed their progression to Nike’s constant attention toward the needs of the athlete. It was obvious that serious competitors and occasional participants alike required more from their gear than they were getting. And it was, and has always been, Nike’s duty to give it to them. From discoveries made in cotton and Lycra-based fabrics, Nike designers dove deeper into findings derived from their work with physiologists and trainers. The simple act of perspiration became the key to the next breakthrough. The body’s need to release heat generated by exercise, leading to evaporation in the form of moisture to keep core body temperature cooler, all led to a design theory aimed at allowing the athlete to benefit from this process rather than be slowed down by it. How could gear protect the body from overheating while simultaneously enhancing a player’s performance? The answer was Dri-FIT. Imagine a fabric created to help wick away sweat from the skin, leaving athletes cooler, drier, and much more comfortable. Lighter and tighter than the apparel that came before it, the product born from Dri-FIT fabric enables athletes a previously unknown freedom of movement. A lightweight, porous Dri-FIT fabric allows moisture and air to pass easily through the material while wicking sweat away from the body. As a result the process of sweat evaporation is accelerated, to help keep the body cool and dry. The creation of Dri-FIT forms the foundation of a revolution in product development — a revolution destined to forever change the way athletes prepare for battle, reach for their goals and achieve their dreams. From the beginning of Nike’s exploration into performance-enhancing athletic apparel, the driving voice was that of athletes, coaches, trainers, and equipment managers from a multitude of sports. From American football fields, to soccer fields across the globe; basketball courts to bike routes and running paths, Nike sought to meet and exceed the needs of competitors all over the world. Once Dri-FIT became a staple of the Training product line, Nike invited input from those who would wear and test the gear on a daily basis. It was then that the focus of Nike Training shifted from individual to team. Dri-FIT fabric was used in uniforms provided by Nike to Olympic athletes in 1996, and the 1998 World Championship Football Tournament saw a major leap in players’ awareness of Nike’s innovation in training gear. From there, other categories followed and Dri-FIT apparel permeated sports like tennis, golf and more. The continuous insight from the athlete gave Nike continuous insight into the next step of an evolutionary process. College football in America became a rallying point — the desire of hard-working collegiate players to wear a technologically advanced base layer onto the field of battle gave Nike Training the opportunity to voice its authenticity. Suddenly, the future was now and Nike designers knew exactly what that future called for — an entire line of apparel engineered to the exact specifications of championship athletes. If an athlete is seeking to train, improve, and compete at the highest level they are capable of reaching, then most likely they have already experienced the truth in this statement: The future of Nike Pro is the future of superior athletic performance gear. To bring to life a complete uniform of base layer apparel to protect and improve the level of play for those who wore it, Nike Training commenced design work around a basic question that would be posed repeatedly: What are the needs of the athlete? In 2003, as a result of this question and the relentless pursuit of innovation behind Nike Training’s previous work, Nike Pro was born. 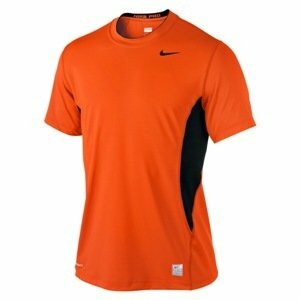 Created to be a performance base layer across sport, Nike Pro gear has become the ultimate base layer for all sports. Injury prevention, body heating and cooling, freedom of movement, and pure performance for competitors in need of apparel matching their desire to train harder and play better — these are the benefits Nike Pro offers competitors all over the globe. Worn and tested by the world’s best athletes, Nike Pro gives youth and amateur players a chance to wear the same base layer trusted by professionals at the pinnacle of their sport. From stretch-fabric tees to compression shorts, Nike Pro is an integral part of the dedicated athlete’s quest to become bigger, stronger, and faster. Because Nike knows the desire of athletes is to gain whatever advantage possible and let nothing slow them down, Nike Pro has been designed to provide maximum performance under any circumstance. Superior mobility, moisture management and exceptional durability are the building blocks of Nike Pro apparel, giving the athlete a solid foundation of technology augmented in various playing conditions. 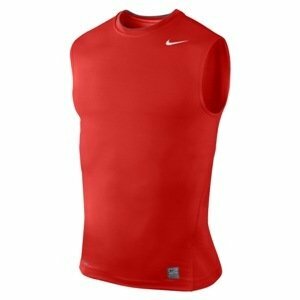 In situations of intense heat, Nike Pro Hyper Cool gear adds zoned ventilation to help pull heat away from the athlete’s body and draw in fresh air. 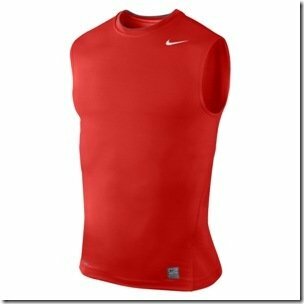 For cold-weather conditions, Nike Pro’s thermal insulation is used to help smoothly transport moisture away from skin while reflecting body heat back to the wearer. By giving warmth to the body without any added weight, freedom of movement is not lost in the process. Protection is added with Nike Pro compression shorts, to guard the body in strategic impact zones with the use of dual-density foam cells. A primary layer of cells absorbs and disperses impact force, while the outer fabric remains durable and smooth enough to deflect impact and protect against abrasion. This is just the kind of protection athletes need when taking a hard hit in the open field. For players who want to slide into third base while minimizing the risk of injury, the Nike Pro Baseball Slider Short is specifically designed to counteract the abrasion caused by that mad dash. By reducing the wear on a player’s legs, durable anti-abrasion material with low-profile, ventilated padding takes the abuse of the sliding action, helping the athlete to arrive on base safely at the exact right time. 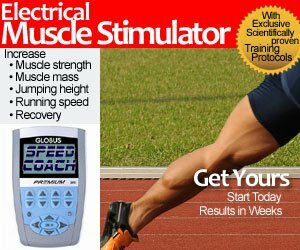 All of these innovations are created with the directive to help keep athletes free of injury while giving them a way to tackle any obstacle standing between them and their chosen goals. For Nike, every second counts when it comes to performance. Every advancement in Nike Pro technology offers another edge to the competitors who have always looked to the brand to provide them with gear they need to go harder, stronger, and faster than they ever have before.